The Belgian Congo--the name conjures up thoughts of great SW. The card at the bottom is from Belgian Broadcasting Services at 247 Park Avenue, New York. It verified reception of the BBS in Leopoldville (now Kinshasa, Zaire), during the Belgian occupation, when all Belgian SW originated from the Congo. The OTC card dates from 1947. OTC was widely heard and was very friendly to DXers. 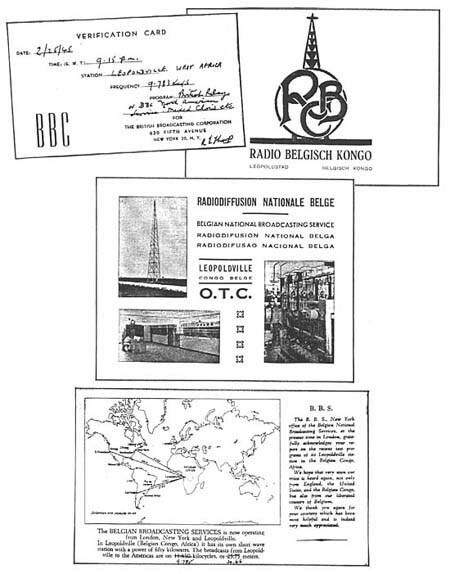 Info on pre-war SW from the Congo is pretty sketchy, but I believe Radio Belgisch Kongo was the main domestic station. This QSL lists 15175, 11730, 9555 and 6010 kHz. And what's this? A real veri from the BBC, and for a broadcast from Leopoldville? For a time in the mid-40's, the BBC New York office was very friendly to SWL's and DX clubs and was issuing its own full-data QSL (these were not prepared cards). OTC relayed the BBC to North America.